We teach children kindness in many different ways: through our own words and actions, by involving our own friends in our lives, by practicing kindness with our family members, by being neighborly and supportive of our community. But one of our greatest teaching methods is one of our most ancient -- we relate and we teach through stories. It’s why books are so powerful in the development of kind, empathetic children, who then grow up into kind, empathetic adults. Science has found that fiction “tricks” our brains, so that we believe we’re a part of the story. We become emotionally invested, and as we do, we become mindful of our own emotions. As our awareness of emotions grows, we start to feel for the characters we read about, which in turn, translates into empathy and kindness for non-fictional, real-life human beings. It’s pretty amazing. 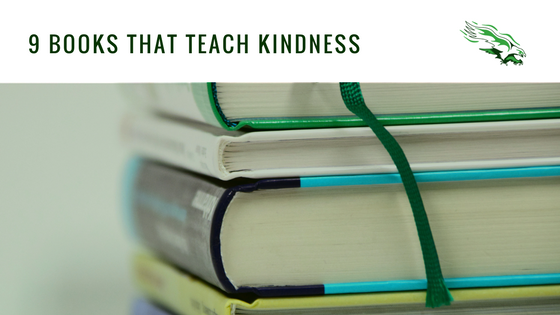 Ahead, find 9 books -- suited for K-4 readers -- that teach kindness. Stillwater is a giant panda. Together with his friends, Leo and Molly, he learns about compassion, sharing, and kindness! Minna and her friends are inspired when they read Aesop’s fable, The Lion and the Mouse. Their teacher, Mrs. Bloom, assigns everyone homework to perform one act of kindness and then create a way to share what they did. Minna performs many kindness acts, and because she can’t decide on just one to feature, creates a whole quilt of them. The quilt then spreads throughout the school, as each student adds their own acts of kindness and kindness itself grows through their school. Amos McGee is a zookeeper who loves spending time with the animals in his care. One day, he wakes up with a cold and must stay home sick. His animal friends miss him, and decide to visit him and repay his kindness. Brian is a very quiet boy, and he feels invisible next to his classmates who are louder and “take up a lot of space.” Even his teacher is too busy with the other kids to notice him. One day, a new kid arrives at his school and notices how kind and talented Brian is. He makes waves by including Brian and teaching the other kids through his actions all about inclusiveness, no matter how loud or quiet someone is. Jeremy is dreaming of a pair of black high tops with white stripes, but his grandmother cannot afford them. When he finds a pair at a thrift store, he buys them with his own money, even though they’re too small -- and ends up with bandages on his feet instead. Jeremy learns a lesson about kindness though, when he gives his prized shoes away to a friend in need, with smaller feet. Help kids learn how to pay it forward through this sweet story about one kind deed that multiplies as it touches others. One day after church, CJ and his nana don’t go home. Instead, they wait for the last bus. While CJ is caught up in thinking about what others have and what they don’t, his nana teaches him to find beauty in the ordinary, everyday things. Finally, they reach the last stop -- a soup kitchen for the homeless -- and CJ jumps into his nana’s giving, appreciative spirit. Winner of the 2016 Caldecott Award and 2016 Coretta Scott King Illustrator Honor Award. A grandfather teaches his grandson the simple rule of treating others how we want to be treated ourselves, and how to apply it to his life. *All book cover images are sourced from the Kansas City Public Library.